The price for this packet represents about 30% savings over purchasing the plans individually and saves you $104! 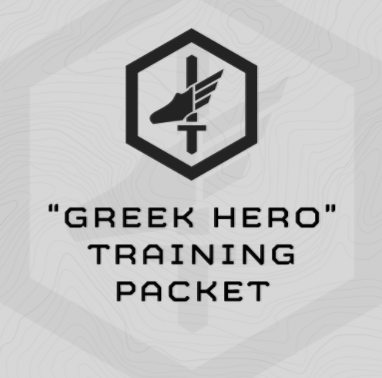 The MTI “Greek Hero” Training Packet is composed of our 6 “Greek Hero” training plans developed for military athletes as well as our Military OnRamp plan. 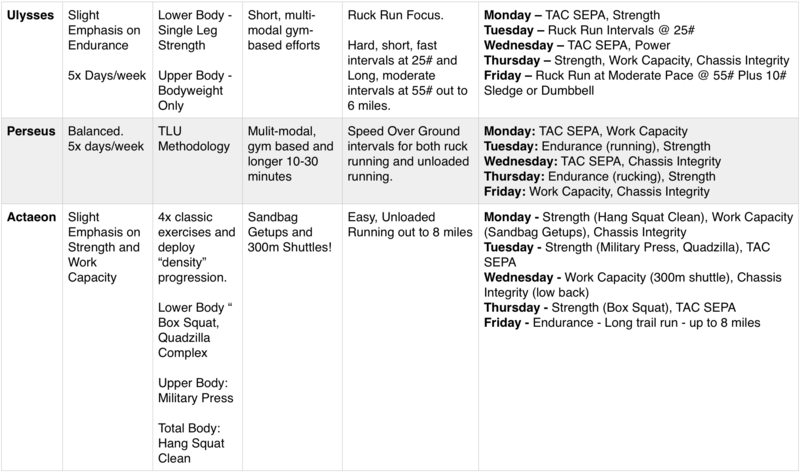 You can also click on the individual plans above to see the required equipment for each specific training plan. We recommend the order listed above. This is the way we completed them at MTI. What is the difference between the Greek Hero plans and the Virtue Series Plans? 1. The training plans in both series were both initially completed by our tactical lab rats, including myself, at our facility in Wyoming. The Greek Hero Series deploys our most recent programming. The Virtue Series deploys our previous version. 2. Both Series are designed as day to day programming for tactical athletes. The Virtue Series concurrently trains strength, work capacity, endurance and chassis integrity. The Greek Hero Series trains these attributes plus TAC SEPA (tactical speed, explosive power, and agility). 3. Each plan in the Virtue Series trains these attributes concurrently, but each also emphasizes certain attributes. Fortitude, for example, emphasizes gym-based strength and moderate paced mid distance endurance. Some of the Greek Hero plans likewise have areas of emphasis, but it is more subtle. The more defined emphasis in the Virtue Series allows me to target these plans to athletes relatively new to our programming, or who need to work on specific areas. 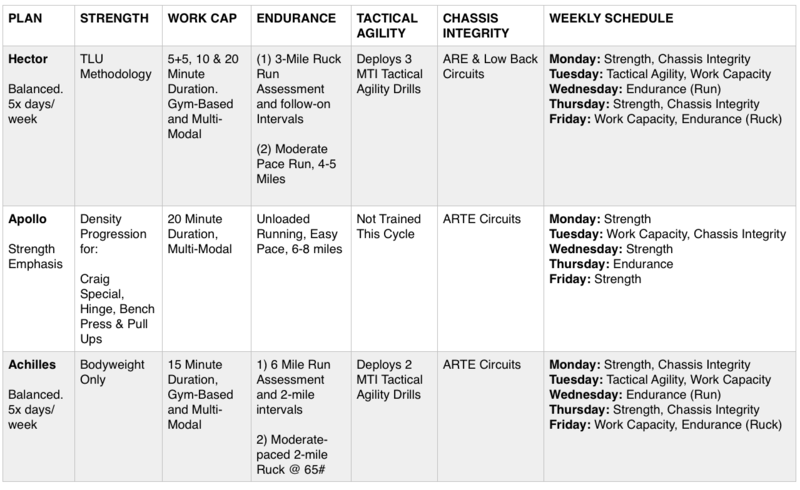 As tools, I can deploy for athletes the Virtue plans are a little more blunt. The Greek Hero plans are more fluid, subtle and sophisticated. The Virtue Plans make a great foundation for the Greek Hero plans. See our Exercise Library HERE. The Run/Ruck Calculators are listed as an exercise. What do you mean by 15 Minute “Grind”? You should work your way through these circuits briskly not frantically. How do I access the plan? You can access the plan via username and password either through our website or through our app ((Mtn Tactical Fitness) available for IOS and Android. Click on each individual training plan above, then click the “Sample Training” tab at the plan product page to see sample training. "I have been dabbling in the Greek Hero Fitness Plans for about a year now. I completed Hector, Perseus, and Achilles and then randomly gave myself an APFT plus an UBRR and an 18 mile Ruck in the course of about a week. I scored a 296, crushed the minimums of UBRR, and a 4:51:00 on 18 mile with @ 60lbs (Finish not Win pace). It should be noted that I suffered a Grade 3 ACJ in 2013 non surgical and that when I found out about you guys. I started with your bodyweight plan to get back on my feet. I know all of your plans work. Diet has been key. No Alcohol. I am 34. Thanks for what you do and I will be buying the rest of the Greek Hero plans. I just have to go do this “thing” first. They are the best blend of running, rucking, lifting, and explosive bodyweight exercises I have ever done. My friends that suffer through Thor 3 watch in envy. Some of the exercises go easy and I was able to add to them. For example, 6 rounds power clean followed by rope climbs is an awesome concept. It crushed me at first. Then I started doing 3rounds with a 25#vest 3 rounds bodyweight. Then that turned into the whole thing with vest. Then that turned into sliding 2x 5 lbs plated in my vest with plates in already. Then that turned into adding 6 pull-ups with vest after the rope before rest(which I would extend by 30sec) and then the next power clean. I learned that I was pushing it as I started to get major fatigue in my forearms so I backed off for a while and then move on to a different plan. That plan also had power clean rope climbs (Yes!) I went back to splitting reps half vest half bodyweight and I highly recommend adding the change no pullups... I can sweep up the rope now like a 90lbs Pacific Islander and I am around 200 with an X frame and can’t dance. I say all this to give feedback. Help the plans evolve. Help you guys stay competitive. The Greek Hero plans have it all. Everyone comments on what I do. I don’t do it because of that. I do it because it’s not standing in front of a mirror curling or working cable tri’s meanwhile having a gut. Far too much of the warrior community are peacocks. They take the easy road by shaping muscle, by looking strong, not performing, hoping to deter aggressors. That is sheepdog mentality. They want to make a big display on the perimeter of their courage. That’s not for me anymore. I desire to live out past the perimeter now. I digress. If you asked what could be added I would say I am at a point where I need more emphasis on stretching rolling soft tissue stuff and your programming will knot you up fast. I have blended Thor 3, Some Squat University stuff, and your warmups and cools downs and it seems to be helping prevent injury. Over the last year the most common tight spots or pain areas were the arch of the foot tightness, calf’s, hamstring lower back. Thanks for what you do. Hope this helps." "First and foremost I believe the program is working. I’m currently deployed right now with the Army National Guard and a cop back home. I feel like this program (Operator Hector) has gotten me into the shape I need to be in to continue to be successful here and back at home. Prior to finding your workout programs, I developed one for myself. It was good, I was able to stay in pretty good shape but it was starting to get old and harder to find new things to integrate. Your programs have been just awesome. The workup and building up to the next program has been reasonable. There haven’t been a lot of workouts I haven’t felt like I could complete. For me the only improvement I could see is maybe in the military on-ramp program you could have introductions to the Olympic lifts. Prior to your programs I only had experience with back/front squats and RDL’s. It took a minute to grasp the power cleans. Most importantly the proper form. For that reason there were times were I couldn’t meet the suggested weight for the lifts. The Greek hero program can be pretty long and luckily I have time over here to be at the gym for 2 hours. At home, I won’t have that luxury so I bought the busy operator programs which I’m really excited to try."